This installment of Rite Publishing’s classic series clocks in at 19 pages, 1 page front cover, 1 page editorial, 1 page advertisement, 1 page SRD, 1 page back cover, leaving us with 14 pages of content, so let’s take a look! So, as always,w e begin this supplement with a latter, as the meta-narrative of this series assumes that a member of the respective race is writing a letter to sage Qwilion of Questhaven; This sets the series apart from the get-go – unlike most racial supplements, the prose and colored/unreliable in-character narration assures that the pdf is actually fun to read and not just a dry assortment of numbers. This is a big plus as far as I’m concerned. In this case Phaedra, a member of the equine race of re’em, (how the unicorns refer to themselves) begins the narration with a summary of how the race views their own physiological differences from most humanoids. The pdf then proceeds to grant us insight into re’em culture, their herds etc. 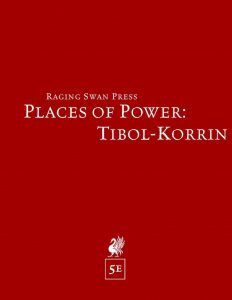 – and here, Rite Publishing must be commended. Instead of just duplicating the flavor from the PFRPG-version, we get a rewritten version of the whole account, taking e.g. the presence of warlocks in 5e into account. You may consider that to be a small thing, but for me, it represents the difference between doing what’s required and going the extra mile. It was an impressive surprise. There is an obvious and intended “The Last Unicorn”-vibe conveyed by the prose, as the noble courtier tells us about the importance of hope…and sorrow…and what they can d. Beyond this glimpse at the psychology of these noble beings, we also learn about interactions with humanoids, providing a perspective on such happenstances from an insider’s perspective. So yeah, the flavor aspect is excellent. Now, let’s take a look at the crunch, shall we? First of all, re’em increase their Constitution by 2 and mature quickly; they never die of old age, and their type is governed by the subrace chosen. However, it should be noted that spells that affect humanoids, thankfully, still affect re’em. As quadrupeds, re’em are restricted to horse barding and somewhat limited in using many consumables, but they may cast spells with somatic components as usual. They have darkvision and their horn deals 1d8 piercing damage. When charging at least 20 ft. in a straight line and attacking with the horn, this damage is increased by +2d6 piercing damage, making them rather lethal at first level. Re’em also have hooves and may use either both front or rear hooves for a 1d6 bludgeoning damage attack. These natural weapons are considered to be magical for the purpose of overcoming resistance and immunity. 4 subraces are provided: Celestial re’em increase Wisdom by 1, get the celestial type and know the spare the dying cantrip. 3rd level nets cure wounds once per long rest interval, 5th level lesser restoration once per rest interval. These are governed by Wisdom. The race also gains resistance to poison damage and advantage on saves vs. the poisoned condition, and these benefits extend to creatures riding the celestial re’em. The second subrace would be the ki-rin, who increase Charisma by 1, are celestial, type-wise, and when not wearing armor, have an AC of 12 + Charisma modifier, minimum +0. The armor class of riders may not be less than 10 your Charisma modifier, unless they are riding the ki-rin against their will. The alicorn of the ki-rin nets resistance as a cantrip, and 3rd level provides bless, 5th level aid, both of which are usable once per long rest interval and are governed by Charisma. Thirdly, we have the fiendish re’em, the dark unicorns, who increase Intelligence by 1, are, type-wise, fiends and gain resistance to fire, which may be extended to riders. Their alicorn nets produce flame as a cantrip, with 3rd level yielding hellish rebuke and 5th level darkness once per long rest interval. You guessed it: Governed by Intelligence. Finally, sylvan re’em increase Dexterity or Charisma by 1 (your choice) and have the fey type; they have advantage on saving throws versus the charmed condition and can extend this benefit to riders. Their alicorn nets minor illusion as the cantrip, and at 3rd level faerie fire, at 5th level calm emotions. As before, both of these latter spells are governed by Charisma. All subraces also grant languages appropriate for their themes. We get a new paladin oath next, the oath of the greenwood, which comes with fully formulated tenets and two new fighting styles are noted: Impaling and Trampling. Both are concisely presented. The oath gets its own oath spells and the 3rd level nets two channel divinity options: One is really cool, as it laces thunder in your hooves allowing for quicker movement and more damage/better attacks. The second option is also AMAZING, as it emphasizes teamwork: Nearby allies may target additional beings with beneficial healing-based spells. Love these! Also at 3rd level, we get mystic link, which allows you to attune your horn to a weapon as part of attuning the weapon, allowing you essentially to keep fighting with your horn. At 7th level, we get an amazing aura – the horn sheds light that the unicorn can suppress, sure, but this light also cancels darkness…and enlightens metaphysically, suppressing blindness! I love the visuals here. 15th level nets an additional channel divinity option (which is, slightly oddly, formatted differently than the previous ones, but that is pure aesthetics): Here, we have wind striding, allowing you to run over any substance unharmed, up to 90 ft. away from the ground, and you can carry up to two Medium riders with gear, provided you do not exceed maximum encumbrance. You can also ascend on empty air. I love this. The two rider option made me recall the famous templar symbol…and the mythological link works, once you recall that unicorns were often used as a cipher for Jesus in occult Christian texts., 20th level allows you to call an ancestral unicorn to your side to aid you. Cool! We also receive the elder unicorn sorcerous bloodline. From 1st level on, when learning spells, you can choose druid spells instead, up to half of your total of spells known. You also gain proficiency in Religion and Nature, and may use Charisma as governing attribute for them instead. 6th level has a cool trick: When you cast a druid spell, but it doesn’t do damage (even if you intended it to do damage! ), you get to cast a cantrip as a bonus action. If the cantrip deals damage, it deals bonus damage equal to the level of the spell slot expend by the triggering spell. This makes “missing” with spells less of a bummer and nets a second chance. Love it! 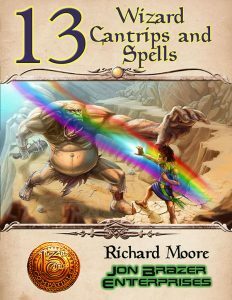 At 14th level, the character learns geas as well as the option to expend a spell slot: If the spell slot expended had a higher spell level than a curse, oath, etc., you can end the effect. The ability takes same level of curse and spell slot into account. Really cool! 18th level is also really cool, teamwork wise: After casting a spell with a spell slot of 1st level or higher on your turn, you may take a reaction to a nearby ally casting a spell. If you do, the spell is enhanced and treated as one level higher. Love this! We also get the vile pact of the sundered horn for warlocks, accounting btw. also for re’em that sacrifice their own horn! Cool! The pdf also sports a paragon/exemplar class, here, the Silvermane Exemplar, who comes btw. with quick build rules. Only re’em qualify and they get 1d8 HD; proficiency-wise, we get all armor, one type of artisan’s tools, Constitution and Charisma saving throws, and two skills chosen from Athletics, Insight, Nature, Perception, persuasion, Religion and Survival. 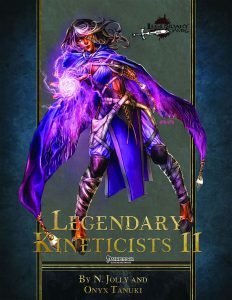 Starting equipment is noted and the class begins play with the mage hand cantrip, which may be explicitly used with proficiency bonus, if any, when employed with artisan’s tools and ability checks. Ability scores increase at 4th level and every 4 levels thereafter, up to and including 16th level. A silvermane exemplar begins play with a pool of inner light, equal to the class level. This resource may be sued to cast the spells granted by the alicorn class feature additional times sans a low rest (1 point for 1st level spells, 2 points for 2nd level spells). Additionally, as an action, you can spend a point and touch a willing creature, granting the target Charisma modifier temporary hit points. Alternatively, as an action, you may heal 5 times the amount of inner light spent of the ability in hit points to a target creature. 2nd level provides one of my favorite class features of the class, Purity and Sorrow. When you hit a creature with an attack roll, you gain Sorrow. When you restore hit points to an ally or provide temporary hit points/end conditions for them, you gain Purity. When you restore it points or grant temporary hit points, you may expend Sorrow to add 1d6 to the hit points granted or restored. When you roll damage for an attack, you may expend Purity and add +1d6 radiant damage to the damage dealt. These fade after 1 minute if not used. The dice they employ increase to d8 at 5th, d10 at 10th and d12 at 15th level. I love this, though it should specify that e.g. hurting harmless kittens could not provide Sorrow. Anyways, this feature thus rewards alternating between offense and defense and encapsulates the flavor really well. 5th level provides multiattack, 6th level the oath’s mystic link for weapon-to-horn-attunement; additionally, 6th level lets you spend inner light to grant adjacent creatures resistance to one of several damage types, with more targets costing more points. 9th level yields an alternate, humanoid form. At 13th level, when moving or using Dash, you can spend 1 inner light to teleport the distance instead. Starting at 14th level, when gaining or ending Purity, you can use a bonus action to generate a breeze that ends harmful conditions for a creature nearby. This does not net you Purity. You can also end confusion or curses, within limits. 17th level lets you spend 4 inner light to grow glorious, feathered wings that last until you gain Sorrow. At 20th level, you regain 4 points of inner light after a short rest. Obviously, the class also has some sort of choice baked in; that would be the noble orders. These define your class features gained at 1st, 3rd, 7th, 11th and 18th level. 4 orders are provided: Royals, Courtiers, Knights and Knaves. Royals gain fire bolt and may later heal a creature within 30 ft. when healing via inner light while they have Sorrow. Healing and aforementioned mystic link improvement as well as a high level sun-crowned form make for a cool choice here. The courtiers are more skillful and have, as befitting their title, charm/dominate-themed abilities and sanctuary effects. These are the more tricky ones. Knights get a fighting style, may grant allies the ability to move as a reaction and penalize foes with Purity/Sorrow dice. Finally, the order of knaves has a cool ability that allows them to disguise their horn – if a target doesn’t know your name, he fails to see it! Using abilities, obviously, can also reveal who you are, and the order focuses on establishing a bond with another character, which can be really rewarding, roleplaying-wise. Editing and formatting on a formal level, are very good. On a rules-language level, the book is excellent and really interesting, providing a distinct array of complex rules-concepts. Layout adheres to Rite Publishing’s beautiful, new two-column full-color standard and the pdf sports quite a lot of interesting full-color artworks that diverge in styles employed. The pdf comes fully bookmarked for your convenience. BJ Hensley’s original PFRPG-take on the playable unicorn was already rather cool; what Brandes Stoddard did with it, was inspired. 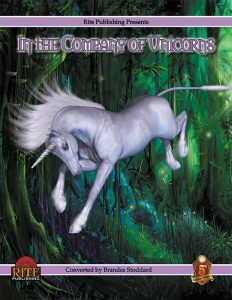 The 5e.version of the playable unicorn is creative, distinct and provides a surprisingly concise take on the concept. The class options are well-crafted and the new class rocks, offering a playstyle that feels distinct, fresh and different. The fact that the lore reflects the mechanics is just the icing on an awesome cake. I love this supplement. The only blemishes I could find are exceedingly minor and represent only aesthetic gripes. Hence, my final verdict will clock in at 5 stars + seal of approval. You can get this well-crafted, cool supplement here on OBS! Missed the equally impressive Player’s Guide? You can find that book here! 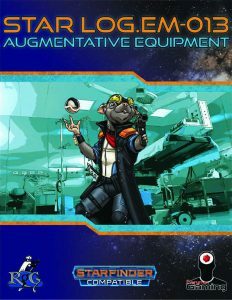 We begin this supplement with a brief look at augmentation in the galaxy and the Xa-Osoro system in general, before getting a massive table that lists the material by price and level, noting system modified as well. We also have the new weapon fusion, biointegration, which clocks in at only 680 credits, which represents the classic means of the integrated weapon. While deployed, you can’t do anything with the hand but use that weapon. Unfusing is a move action and only one-handed weapons may be fused thus – the plus-side being obviously that dropping or disarming is out of the question, and half damage dealt to the fused weapon is dealt to the character instead of the item, which can make for an interesting double-edged sword. Haha. Get it? …Sorry for the bad pun. Anyways, we also get two new armor upgrades. Phantom emitters are classified as hybrids, and can compress armor via extradimensional means into 1/16th of the usual size sans modifying your size category, allowing you to squeeze through 1/4th your space sans counting as squeezing. While the armor is thus compressed, you have 360° vision and move via rolling, restricting you to unarmed strikes that benefit from shock, but are not considered to be archaic. On the plus-side, total defense in ball form is more useful. Weapon integration systems can be installed into light and heavy armor only and make it possible to install weapons as though the suit were a power armor, with weapon types codified properly by weapons slots granted by this upgrade. The pdf also sports 4 different biotech augmentations. Adamantine boneplates are provided up to MK 7, granting increasing DR (or improving your existing one); as it applies to the skeleton, it has a different system than dermal plating, but they may explicitly not be combined. Good catch. Biotic Flight is added to the spinal column and comes in Mk 1 – 3, beginning with basically gliding and improving to include first clumsy and slow, then better, flight. Spiked growth depend, system-wise, on where you get them, but they enhance your climbing capabilities and provide the means to inflict piercing damage with unarmed strikes – the augmentation is presented in one version. Cool: the rules take hardness of surface scaled into account AND also provides a benefit for folks with Improved Unarmed Strike. Kudos! Finally, the muscle mass magnifier lets you execute penetrating unarmed strikes, with 9th level plus adding critical effects. Nice! They are presented up to Mk 10. Editing and formatting are very good, I sported no serious hiccups. Layout adheres to Everyman Gaming’s colorful and nice two-column full-color standard and the pdf has a nice artwork, as seen on the cover. The pdf has no bookmarks, but needs none at this length. Alexander Augunas’ augmentative equipment provides several pretty crucial modifications for characters. The rules are precise and make good use of SFRPG’s item levels; the presentation is precise and, as a whole, I really enjoyed this one, as it provides some classics that I as an old Shadowrun-veteran simply expect to see from futuristic games. In short: Very much recommended, 5 stars + seal of approval. Now, as always, there are quite a few crunchy bits spliced into the description of this place. We get a brief section on local lore for PCs that do their legwork, notes on local dressing habits and nomenclature, as well as 6 different whispers and rumors for the PCs to unearth. The 5e-version sports a sensible marketplace of goods to purchase, properly adjusted for 5e’s realities. The pdf also provides some suggestions on how to best use this. Now, if the big picture situation on its own were not interesting enough, the pdf also provides detailed fluff-only write-ups for the romantically-involved commanders that have bridged the gap between baronies, of sorts at least. There is more to note here. A mad hermit has his own cove here, and while indeed insane, he once was an extremely potent spellcaster, driven mad by apocalyptic visions. Nowadays, the hermit (who also gets a detailed write-up; at this point, it should be noted that 5e-references to default stats have been implemented in a concise manner) considers himself to be the guardian, someone to stem the tide of darkness to come. Indeed, a subtle chthonic leitmotif can be found here and there in the supplement. The keyed locations sport read-aloud text and adventure hooks, both of which are utterly inspired. For example, a local diver is paranoid about a discovery he made. Beneath the waves, there are two jade fortresses, mirroring those atop the sheer cliffs…but what’s their significance? That is excellence, right there. Mike Welham’s name on a roleplaying supplement is a pretty good indicator that you’ll receive something that is AT LEAST good, quite probably excellent. 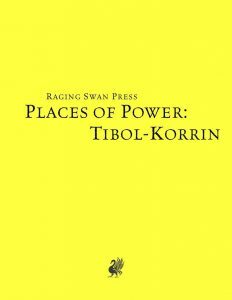 Tibol-Korrin belongs firmly in the latter category. Beyond the already intriguing basic set-up, the book goes one step beyond, time and again. We have a personal level; we have the potential for horror, for tragedy, for war, for peace. 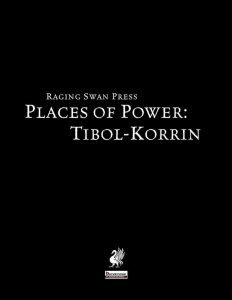 This supplement manages to marry a sort of melancholia inherent in the geography and situation, with an after-war world-weariness that is sharply contrasted with the presence of clear peace-indicators and the joys of burgeoning love. 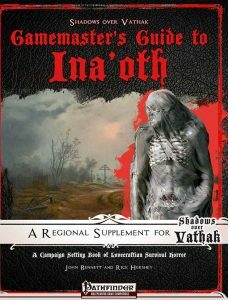 We add a sprinkle of sword & sorcery, a dash of what may be a fairy tale or a gothic tale of woe and tragedy, and have a location that manages to serve a vast variety of functions in your game. It should be seen as testament to his talent that the author managed to construct this place in a way that makes it possible to employ all these disparate elements at once and even brew them into a concise whole, all without making the place feel disjointed or artificial. 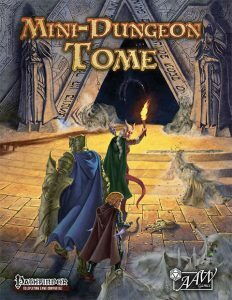 The 5e-version does not lose any of the small tidbits of crunch interspersed throughout the PFRPG-version, making it a detailed and worthwhile conversion. In short, this is an absolutely inspiring, glorious supplement that oozes flavor from each word, an exercise in super storytelling. The conversion to 5e has been handled with care and attention to detail. My final verdict will clock in at 5 stars + seal of approval. Now, as always, there are quite a few crunchy bits spliced into the description of this place. We get a brief section on local lore for PCs that do their legwork, notes on local dressing habits and nomenclature, as well as 6 different whispers and rumors for the PCs to unearth. The system neutral version sports a sensible marketplace of goods to purchase, adjusted to the realities of old-school gaming. The pdf also provides some suggestions on how to best use this. Now, if the big picture situation on its own were not interesting enough, the pdf also provides detailed fluff-only write-ups for the romantically-involved commanders that have bridged the gap between baronies, of sorts at least. There is more to note here. A mad hermit has his own cove here, and while indeed insane, he once was an extremely potent spellcaster, driven mad by apocalyptic visions. Nowadays, the hermit (who also gets a detailed write-up; class references have been adjusted to reference old-school classes) considers himself to be the guardian, someone to stem the tide of darkness to come. Indeed, a subtle chthonic leitmotif can be found here and there in the supplement. The keyed locations sport read-aloud text and adventure hooks, both of which are utterly inspired. For example, a local diver is paranoid about a discovery he made. Beneath the waves, there are two jade fortresses, mirroring those atop the sheer cliffs…but what’s their significance? That is excellence, right there. In short, this is an absolutely inspiring, glorious supplement that oozes flavor from each word, an exercise in super storytelling. The system neutral version, surprisingly, does not lose any of the small, compelling details and minor injections of rules material that made the other two versions work so well. My final verdict will clock in at 5 stars + seal of approval. That being said, as a reviewer, I can’t fault the book for its intended design goal of faithful rendition, particularly when it does such a SUPERB job at it. 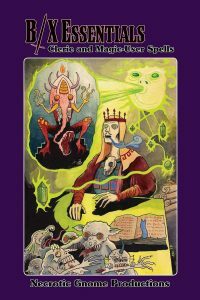 The presentation of the spells is absolutely gorgeous and showcases how a small OSR-publisher like Necrotic Gnome Productions can provide impulses for the industry at large. This type of concise spell presentation is a joy to behold. It’s clever, concise and clean. It’s simple and elegant. I adore it. So yeah, with but one minor oversight in the very subdued and faithful streamlining, this may well be the best iteration of B/X-spellcasting you’ll ever get to see. It bespeaks the author’s passion for the rules-set and showcases a humility and reverence to the subject matter that is refreshing to see…all while clearly showcasing the design and presentation-skill the author obviously has. In short, this is a one-map passion-project, apart from the art, and an example of the best ones in that category.